Hooray! Photos from my trip to Norway. 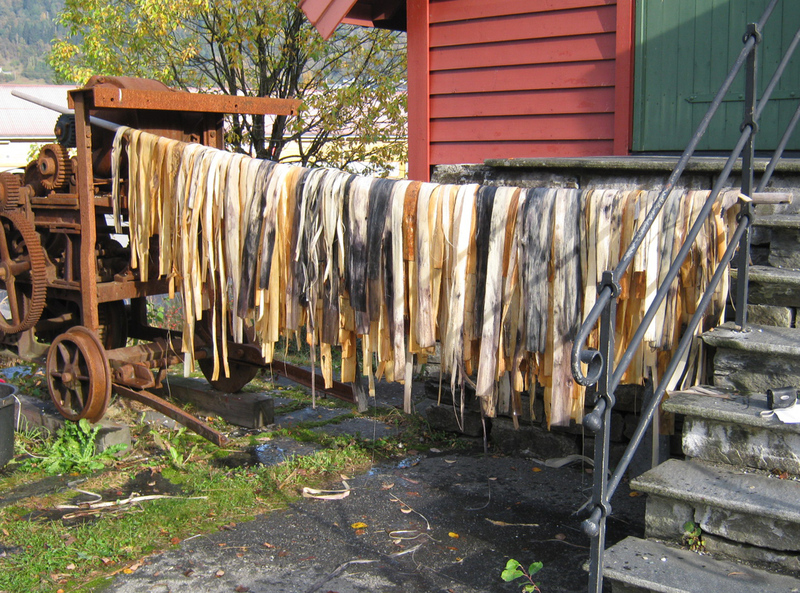 Here’s some photos from my recent trip to the Hardanger Ship Preservation Centre in Norway. 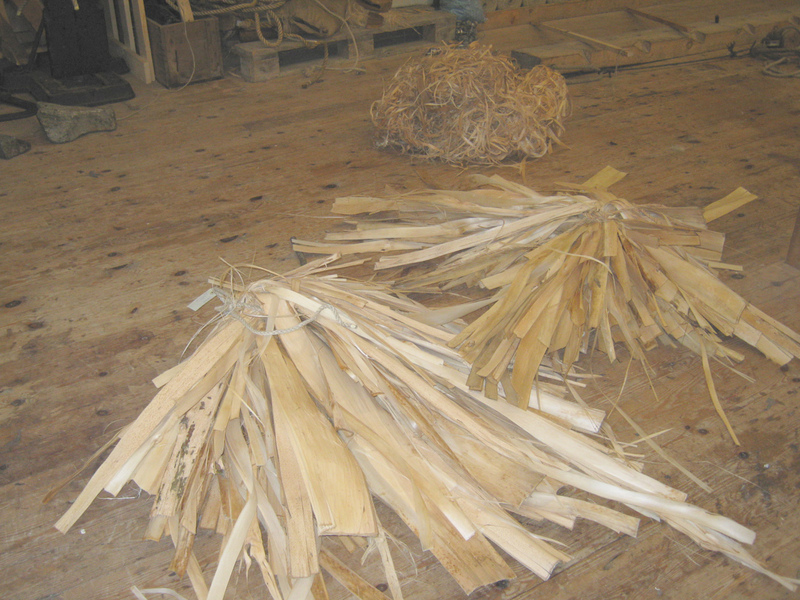 The first two days there I was working in the rope walk helping to make rope from lime tree bark. Apparently it’s what the vikings used and it’s a very smelly process to start with. It must be really authentic. Anyway the bark is stripped from the Lime Trees in June when the sap is running and then it is kept in the sea for a few months. It is then taken out and the smell is something woeful first thing in the morning. It’s heavy, slimey and not very pleasant stuff. So to make it a little more manageable we’re rinsing off most of the slime and gunk before we start peeling the inner layer of the bark off to harvest the fibres that will eventually be turned into rope. Here I am smiling, you don’t get that very often in a photo. I usually look like a bit of a prat when I try to smile. And this ones no different. I don’t know why I’m smiling it was only about 3 degrees centigrade and that water was chilly. You can see in the photo that I’m holding a piece of the bark that is then hung up to dry like in the photo below. Only the layers of fibers closed to the tree are used to make rope as they are the longest and finest. 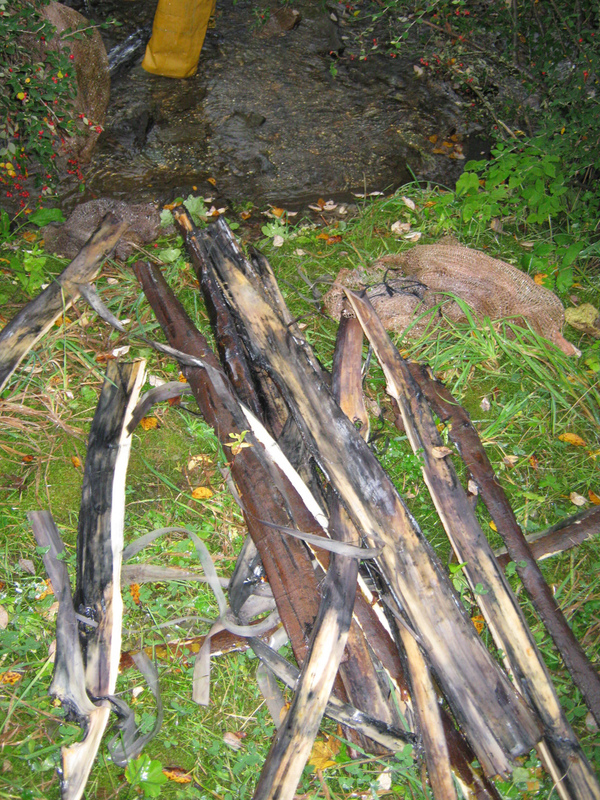 As one moves through the bark to the outside the layers develope lots of holes and the fibers are shorter and thicker. Here you can see some of the lime tree bark fibres drying. Once the fibre sheets are dry they are again split lengthwise into strips about 5 to 10mm wide before being spun into individual strands which are then spun into rope. We didn’t get that far through the process while I was there. 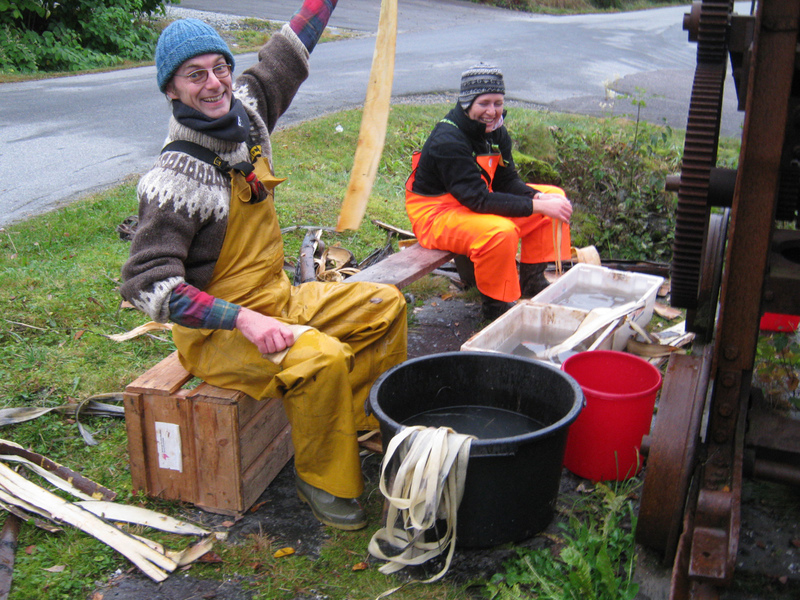 The two ropemakers were busy researching the now lost technique of making rope from seal and walrus skin. They told me if I thought Lime tree bark stank that I should get a noseful of putrid seal skin. Apparently you have to chew it to be able to make the rope. Ugh! 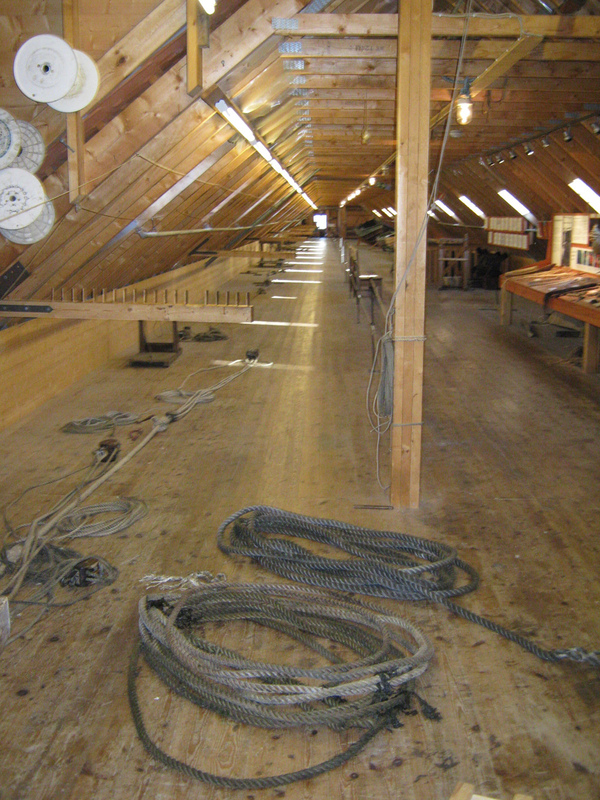 Below is a picture of the rope walk it must be about 150′ long and is where they spin custom hemp ropes for tallships and historical vessels from all over Europe. Many thanks to Anke Eckardt who kindly gave me these photos. 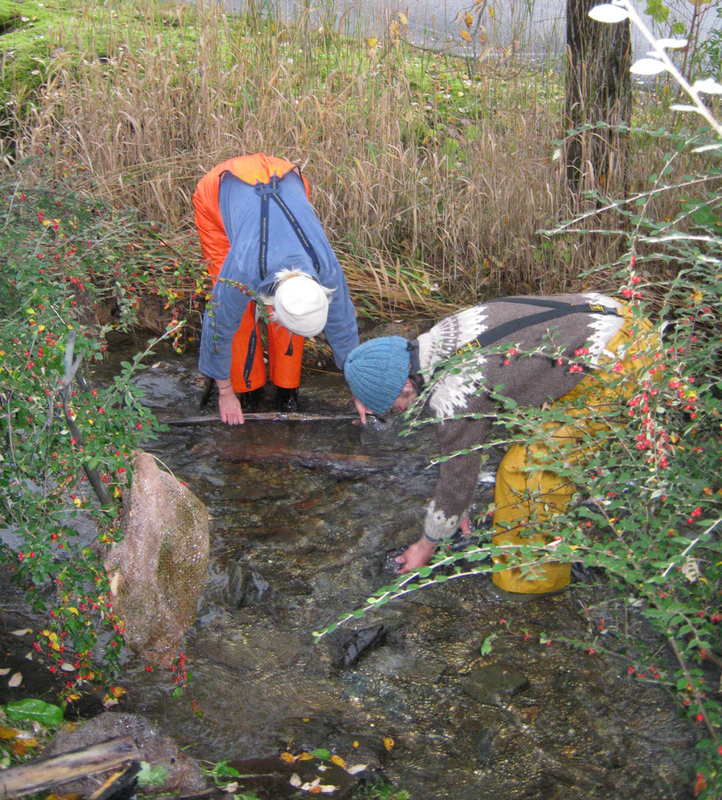 She travelled with me to Hardanger and is also a Ballydehob based boat-builder.